Turkey and Fenerbahçe SK right-back Gökhan Gönül has been removed from Turkey squad due to a bone bruise on the second metatarsal bone on his right foot. In his speech, 23-year-old Gökhan stated his sadness about the development, by saying: "In the final matches of the season, I took part in Fenerbahçe's matches on my own will. This increased the intensity of my injury and I deeply regret this now. It's impossible to define my own feelings. I was looking forward to the EURO. I'm not angry with noone. For three days, Bayern München's doctor treated me. He told met hat my recovery period wouldn't be short and added I would need four weeks to fully recover. I was about to take part in one of the world's biggest tournaments. It was a great opportuntity to show my talents. I made a mistake and now I apologize for this. I'm planning to go to Switzerland to support my team-mates. I believe that they're going to be successful in the tournament. Gökhan played a key role at Fenerbahçe's UEFA Champions League success and showed a very good performance throughout the season. 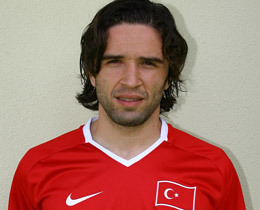 He played 24 league matches at Turkish Super League.